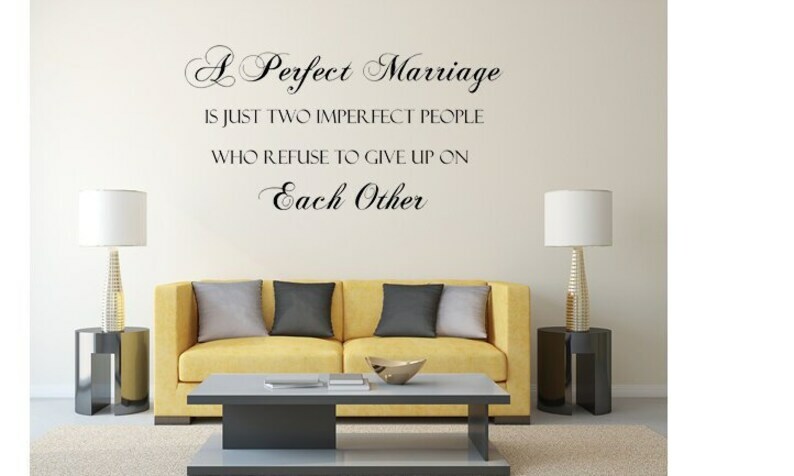 A beautiful and sentimental quote that expresses marriage perfectly and purely! This "A Perfect Marriage Is Just Two Imperfect People Who Refuse To Give Up On Each Other" Vinyl Wall Decal will add a touch of elegance and style to your walls! Make a lasting impression by easily applying this eye-catching decal to a wall in your bedroom, child's room, living room or any room in your home. Please note the size of this listing as the picture may not show the size to scale. This decal is approximately 34.5 inches wide by 18 inches in height. Our decals are customizeable and are available in additional sizes and fonts. If you would like a different size or font, please contact us for a price quote. I put it up crooked(I lost my glasses) but overall I loved how it came out! Always a wonderful seller to deal with. Great communication, shipping time and customer service!! Thank you!